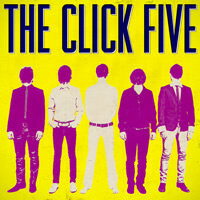 The Click Five are an American rock band. After releasing two albums on Lava Records - “Greetings from Imrie House” (2005) and “Modern Minds and Pastimes” (2007) - with combined worldwide sales of over 2 million, three gold records and eight different #1 singles in seven countries (including a #1 song in the US), The Click Five released their third studio album, "TCV", on Lojinx in Europe in 2011. 18 May 2011 The Click Five webcast tonight! Skriv inn din e-postadresse for The Click Five relaterte nyheter og oppdateringer.